Madrid excursion covers those things within 1hr of Madrid that you would be crazy to miss! Come & see Madrid, certainly, but do not pass up the opportunity to have a once in a lifetime experience for the sake of 1hr´s further travelling! For example would you go to Pisa and not see the leaning tower? Due to excellent train links a Madrid excursion need not cost alot! Most trips can be done for less than 10 € and that leaves plenty spare for lunch at your destination. All excursions listed here are accessable by either public transport or hire car. Of course the latter is still the better option since you'll have full control of your trip. Not only that but car hire services in Madrid are on par with the top companies in the world. Taking the train allows all the travellers to relax and enjoy the benefits of seeing the beautiful Spanish countryside. It certainly helps to ensure a true break from the big city hustle and bustle! El Escorial is located to the north of Madrid and this mountain village is home to one of the largest monestaries in Spain. Built from rock hewn out of the surrounding mountainside by monks in the middle ages the monestary is the focal point of the town. In its present form it continues to hold regular services and a number of monks still live there. The surrounding town has been built to the same style giving the whole town a medieval atmosphere. Within a few km´s of El Escorial in a mountain valley is the "Valle de los caidos" (Valley of the fallen). Turning off the main road a huge catholic cross sits upon a rocky outcrop and marks the final resting place of Spains facist leader Franco. Open to the public year round the visitor can enter into Francos underground tomb as well as enjoy a fresh air, mountain walk. A monestary behind the monument is a lasting legacy to Franco´s association with the catholic church. Putting aside the political associations the sheer scale of this monument needs to be seen to be believed! Spains first capital and today a medieval walled city visited frequently by those who live in Madrid. World famous since roman times for its Swords and from the 18th century onwards for its Toledo Steel it is also home to one of Spains oldest cathedrals which is still in use today! With the fortified city sitting imposingly above the plain Toledo has seen many changes over the years. Today its narrow, winding, cobbled streets and alleys give all the shade you need to walk between attractions. A fufilling full day Madrid excursion some may wish to take a nights accomodation to fully appreciate this city´s charms. A short trip through the mountains sees you arriving at one of Spains provincial capitals in the historic "Castilla y Leon" (Castle & Lion) region, the birthplace of the Spanish language "Castellano". For many years the turreted castle atop the walled city dominated the ancient mountain passage to Madrid. Nowadays the tunneled highway allows you to be there in less than an hour having seen the mountains that form one side of Madrids natural defences! To the south of Madrid this rural town boasts some of the best food available outside of Madrid. 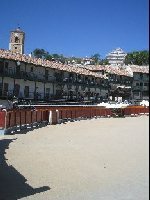 Typical Spanish dishes are served on restaurant balconies overlooking the towns main square unchanged since medieval times. The square itself is a misnomer due to it actually being circular! With the addition of a few pillers and hoardings the cobbles are transformed into a fully fuctional bullring. Unless you are of a strong constitution? Order something other than steak if there is a fight in progress when you arrive! Home to the most spectacular of the Spanish royal family´s Madrid retreats the palace is open to be viewed by all. Peruse it at your leisure or visit one of the nearby retreats built by those wishing to gain favour with the Royals! For something different to historical buildings Aranjuez is also home to the royal gardens. Take a shaded walk beneath the collection different trees or sample the scents of the flower garden. Aranjuez is a Madrid excursion that lets you feel exactly how the "Other half lived" in 18 and 19th century Spain. Madrid excursion too much? Try one of Madrids city Attractions!